five large shrimp are herb marinated and grilled then presented over baby greens with a drizzle of honey balsamic. over a pool of raspberry puree with toasted almonds served with a warm loaf of french bread. stuffed with our awesome shrimp, scallop and crabmeat stuffing, topped with bearnaise sauce. crisp tortillas are layered with mild chilies and cheddar cheese served with sour cream and salsa. lightly breaded and fried. served with marinara sauce. with fresh bacon and melted cheese. stuffed with chicken, fresh bacon, scallions and cheddar cheese. served with sour cream and salsa. 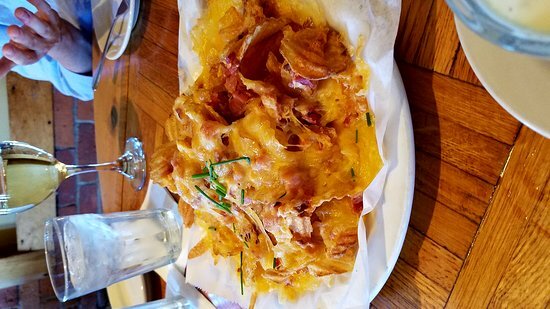 house made potato chips are layered with fresh bacon bits and melted cheddar cheese. served with a ranch dipping sauce. carrots, red cabbage, cucumbers, grape tomatoes, and croutons on a bed of fresh iceberg and romaine lettuce. romaine lettuce tossed with croutons in our own caesar dressing. black olives, cucumbers, grape tomatotes and croutons top a mixture of baby greens. choose your favorite big house salad - adams, ceasar, or waverly - served with a grilled shrimp, sliced sirloin, teriyaki chicken. your choice of dressing. diced anju pears, candied walnuts and gorgonzola cheese top a mixture of dozen differnt baby greens. fresh mozzarella pearls, grape tomatoes, roasted peppers and tortellini croutons top romaine and baby greens. green apples, candied walnuts and cheddar cheese top a mixture of baby greens. fresh bacon bits, diced tomatoes, gorgonzola cheese and hardboiled egg top romaine and iceberg lettuce. Add One Or More Of These Sides To Make Your Meal Complete! bay scallops sauteed in white wine, lemon, butter and parsley. served with rice pilaf. scallops can be deep fried. al dente penne pasta tossed in a rich tomato cream sauce and garnished with shredded parmesan cheese and a slice of garlic bread. one of our famous crab cakes, topped with two strips of apple wood bacon, served on a toasted brioche roll with lettuce, tomato and our louis dressing. served with house cooked potato chips. grilled herb chicken, fresh mozzarella, tomatoes, baby greens and balsamic glace in a warm flour tortilla. served with house cooked potato chips. teriyaki chicken is rolled in a warm tortilla served baby greens, tomatoes and pineapple salsa with a drizzle of teriyaki glace. served with house cooked potato chips. half pound burger, served on a toasted brioche roll with letuce, tomato and american or cheddar cheese. served with french fries. grilled herb chicken breast is topped with roasted peppers, garlic and melted mozzarella with a drizzle of balsamic glace. served on a toasted garlic roll with lettuce, tomato and house cooked potato chips. 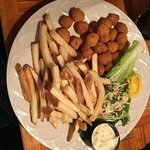 The Following Adams Mill Entrees Are Accompanied By Assorted Hot Dinner Rolls And Your Choice Of Either Salad Below, Soup Du Jour, Or New England Clam Chowder. carrots, red cabbage, cucumbers, grape tomatoes and croutons served on a bed of fresh iceburg lettuce. romaine lettuce tossed with croutons in our own caesar dressing then sprinkled with shredded fresh parmesan cheese. four large shrimp with our awesome shrimp, scallop, and crabmeat stuffing. served with rice pilaf and roasted vegetables. fresh cod filet is stuffed with our awesome shrimp, scallop, and crabmeat stuffing then oven roasted and crowned with bearnaise sauce. served with roasted vegetables and rice pilaf. large fresh sea scallops are lightly seasoned then pan seared. presented over baby greens and served with steamed broccoli and rice pilaf. grilled herb chicken breast is topped with roasted red and yellow pepper strips, fresh roasted garlic, melted mozzarella and a drizzle of balsamic glace. served with roasted vegetables and garlic mashed potatoes. teriyaki marinated chicken breast is grilled and topped with a teriyaki glace and a fresh pinapple salsa. served with steamed broccoli and rice pilaf. boneless breast stuffed with broccoli and cheddar cheese, baked, sliced, and topped with a poulet sauce. served with steamed broccoli and garlic mashed potatoes. the most flavorful cut of steak, lightly seasoned and grilled to your liking. served with roasted vegetables and garlic mashed potataoes. teryaki glaze available upon request. center cut filet mignon wrapped in apple wood bacon, llightly seasoned and grilled to your liking then topped with gorgonzola butter. served with steamed broccoli and garlic mashed potatoes. twin center cut filet mignons, seasoned and grilled to your liking and nestled with our awesome shrimp, scallop, and crabmeat stuffing and crowned with bearnaise sauce. served with grilled asparagus and baked potato. Choose Your Favorite Two!served With Roasted Vegetables And Your Choice Of Rice Pilaf, Baked Potato, Or Garlic Mashed Potatoes. two large shrimp with our awesome shrimp, scallop and crabmeat stuffing. teriyaki glace and pineapple salsa. drizzled with a balsamic glace. slow roasted and topped with au jus. C'est un super endroit pour dîner et l'heure de l'apéritif. Vous y trouverez aussi un second étage et un studio au premier étage salle-à-manger. 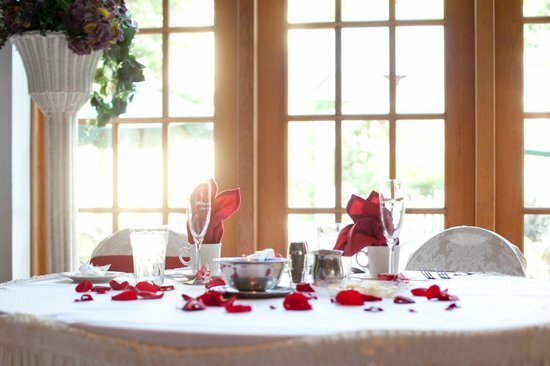 Également, une grande salle pour les brunches. Ils ont Mystery Dinner soir, ce qui est toujours agréable. Nous avions un petit déjeuner pour 35 personnes. La nourriture était très bonne. Le restaurant était très arrangeant et dans l'ensemble, c'était un très bon séjour. Obtenez des réponses rapides du personnel et personnes ayant visité le Adams Mill Restaurant.